This week, at a ceremony in Fleurus, Belgium, Komatsu Europe International presented the International Polar Foundation with a state of the art HB215LC-1 hybrid excavator, which will go into use support polar science at Princess Elisabeth Antarctica. 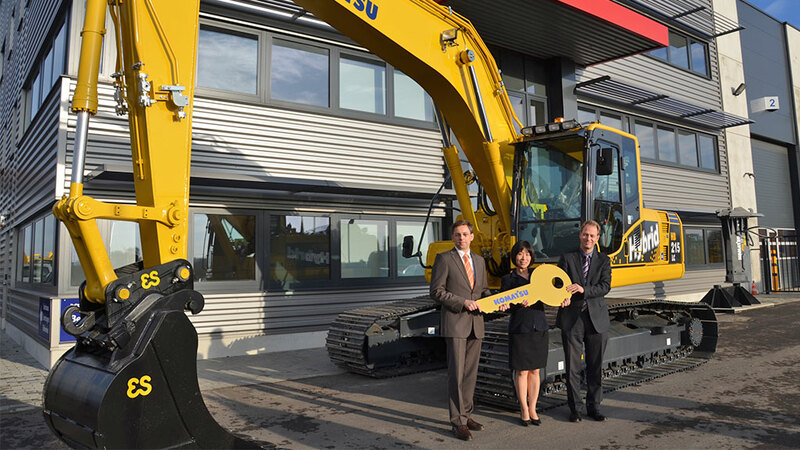 The excavator was handed over to Vice President of the International Polar Foundation Nighat Amin, and Executive Director Andreas Wagner by Komatsu Europe CEO and Managing Director, Keiko Fujiwara at the headquarters of BIA, Belgium’s official distributor for Komatsu. The Komatsu HB215LC-1 is a second generation hybrid machine, boasting an average of 25% less fuel consumption and CO2 emissions than a traditional excavator. The HB215LC-1 channels kinetic energy from the braking created bythe turning motion of the exavator's body directly into energy that is used for operating the machine, instead of storing it in batteries. This means that that HB215LC-1 consumes much less energy than an convention excavator - 25% less, in fact. For such large machines this is a considerable saving, and the HB215LC-1 delivers best performance of any hybrid excavator on the market. At Princess Elisabeth Antarctica, which is a zero emission, wind and solar-powered polar research station; it’s only natural that we should make the move towards vehicles that leave a light environmental footprint on the environment. We're proud that Komatsu recognises the importance of our work in Antarctica, and the value of maintaining strong and professional public private partnerships. On Monday December, 2nd, the HB215LC-1 was loaded on board the Mary Arctica in the port of Zeebrugge for the long voyage south to Antarctica. It’s due to arrive around January 15th - then the Princess Elisabeth Antarctica team will take over responsibility for bringing the excavator on the long 240km trek from the coast to the station, where it will be used for clearing ice and snow and for construction work.